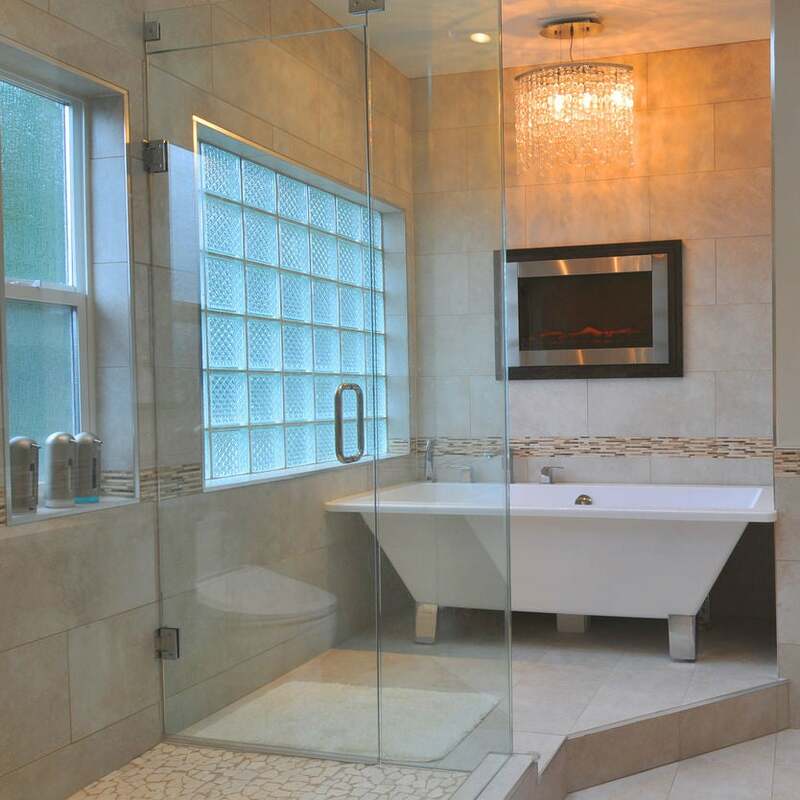 Keep sunlight in and prying eyes out with these privacy enhancements for shower windows. Q: The shower in the master bath of our new home has a window. I’d never seen such a thing before! How can I maintain my privacy while enjoying the sunlight it offers? 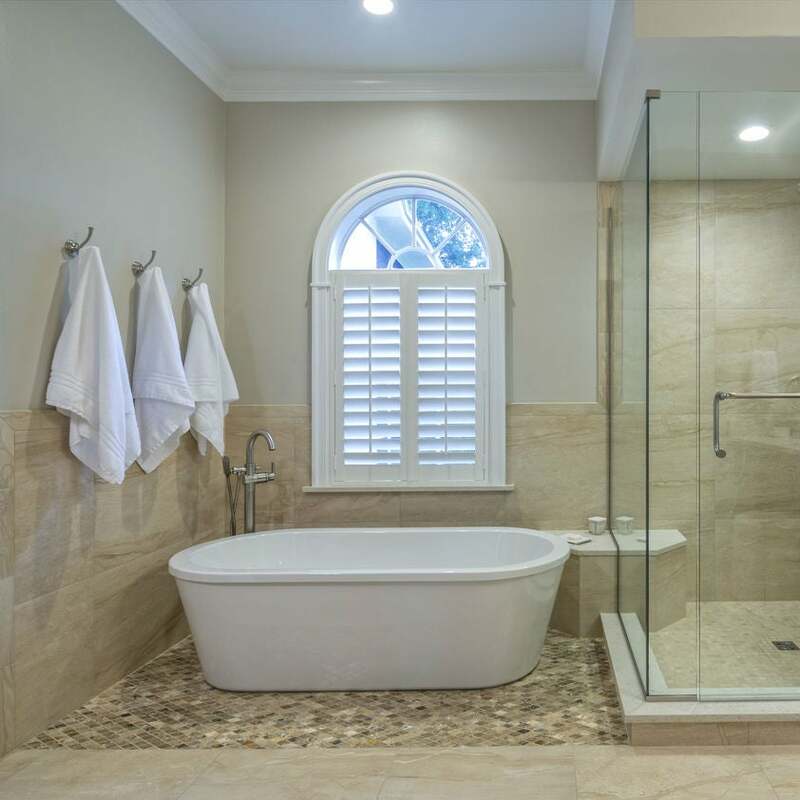 A: While finding a window in the shower may still surprise folks, they’ve become an increasingly common construction feature for a few reasons. They offer a natural source of light and warmth; create the illusion of larger shower dimensions; and, most importantly, provide an escape route for odors and moisture in the air, staving off mold and mildew in the bathroom. But a shower window may also give people outside a glimpse into your most personal space. Fortunately, you can add privacy and still maintain brightness with the creative cover-ups and window replacement ideas here. Install shades or shutters to cover a window in view of the shower. Window treatments are the simplest and quickest way to add privacy. Two top choices are a polyester window shade, mounted over the window, or shutters—vertical stiles and horizontal rails made of vinyl, polyvinyl chloride (PVC), or faux wood fitted into the window frame itself. Shades can be pulled up or lowered with a lift cord that hangs from the top rod to add light and visibility or block it to boost privacy. Plus, shades lack slats through which heat can escape, making them a more insulating, energy-efficient option than shutters. Shutters, however, offer a greater degree of light and privacy control. Twisting the tilt bar (a long, stick-like apparatus) moves the slats up and down, altering the angle at which light enters. Whichever option you choose, avoid bamboo shades or wood shutters in showers. They can warp or form mildew or mold with enough exposure to moisture. Also skip curtains, often made of mold-prone organic materials like cotton. Frosted glass has an appealing pitted effect on one side that increases privacy by blurring any images viewed through the window. Choose from the DIY window frosting methods below, depending on how long you plan to keep the effect. Static window cling film: For a temporary option, use static window cling film—a removable alternative to traditional adhesive window film—in a frosted design. Wipe down the window with a soft cloth moistened with glass cleaner, mist the pane with a solution of 12 ounces water and a few drops of liquid dish soap, and then apply the film, enlisting a squeegee to remove any air bubbles. Spray paint: For a semi-permanent effect, pick up a can of frosted glass spray paint (e.g., Rust-oleum Frosted Glass Spray Paint, available on Amazon) that dries into a decorative coating. Clean the glass as above, use painter’s tape to protect the window frame, and then apply a thin coat of the spray paint to the pane, letting it dry per the product instructions. The paint can later be removed with a glass scraper. Etching: A glass-etching cream (e.g., Armour Etching Cream, available on Amazon) will permanently frost the window in the shower by removing a thin layer of glass, leaving a frosted finish. Tape off the window frame, apply the cream to the pane with a bristle brush, and let it dwell as directed per product instructions before rinsing the cream off with warm water. Or, give it a tint with window film. Tinting windows a darker color with an aftermarket film on the interior side will also enhance privacy. These lightweight, self-adhesive coverings are made of Polyethylene terephthalate and come in a range of types and colors, from weather-resistant security film to heat-absorbing solar film, and from silver to copper. But because certain types of film may possibly damage glass, check that your window manufacturer’s warranty supports the application of window film. To apply, cut the film to the size of your shower window with a utility knife, remove the adhesive backing, and then stick the film to the pane from the top down. Allow the film cure completely, which can take anywhere from four to eight days. 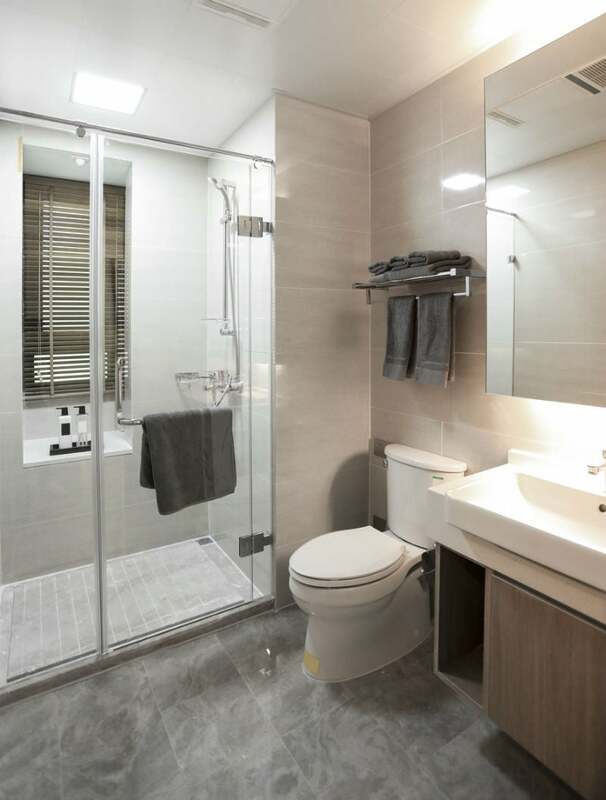 You can shower during this period, but be sure use the exhaust fan to keep humidity levels low and speed up curing. Do not attempt to clean the film until it’s fully cured. Replace the window in the shower with glass blocks. If you have a single-pane window in the shower (i.e., one layer of glass), consider replacing it with a network of glass blocks, which are thicker, solid or hollow pieces that obscure images while doubling the insulation of the window. Glass blocks add an element of luxury to the shower, and can be customized to convey attractive effects ranging from pebbles to cracks. But they’re costly, anywhere from $400 to $1,000 per window—and putting them in isn’t a DIY-friendly job. Install requires a pro to cut the blocks to size, remove the existing window from the frame, and lay the blocks into the wall. Then mortar is placed in between the blocks and steel rods are driven through the mortar to maintain structural integrity (without the rods, the weight of upper rows of blocks can cause lower ones to crack). Finally, the contractor will seal the upgraded shower window with a waterproof caulk to stave off rot around the edges. Bear in mind that you can’t open glass blocks as you can a traditional window, and poor bathroom ventilation can easily lead to mildew or mold problems. To avoid this, install an exhaust fan in and use it during and after every shower.